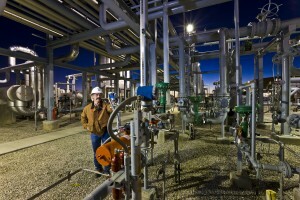 A technician checks gauges at a Whiting Petroleum natural gas processing plant. Photo courtesy of Whiting Petroleum. North Dakota has abundant resources in natural gas. Natural gas in North Dakota is co-produced with oil wells, which means that when an oil well is drilled, natural gas rises to the surface along with the oil. North Dakota companies use natural gas as a resource for producing electricity (see “Peaking” section) and also exports processed natural gas. The North Dakota Pipeline Authority released a natural gas forecast that estimates North Dakota could be producing 2.8 – 3.3 billion cubic feet of natural gas each day in the early 2030s. This is up from 2014 natural gas production of roughly 1.6 billion cubic feet per day. 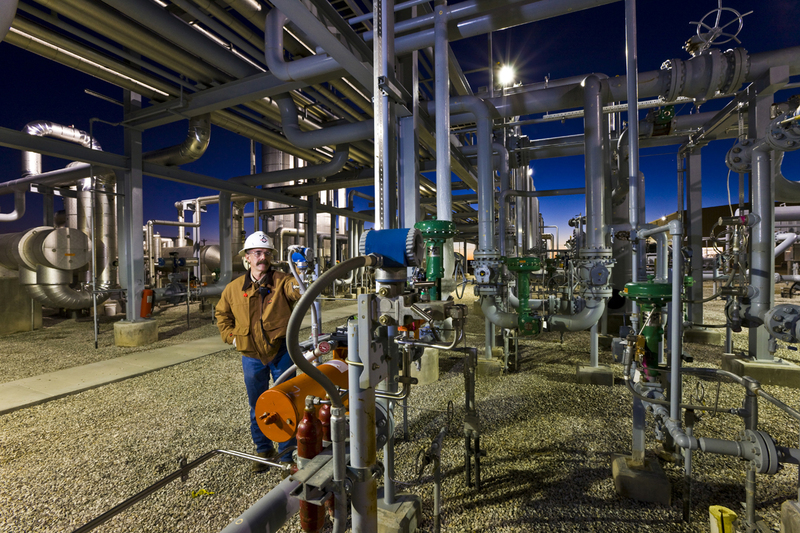 North Dakota currently has 28 natural gas processing plants operating in western North Dakota, and other new facilities are planned or under construction. Since 2010, natural gas processing capacity in North Dakota has grown nearly 312 percent, increasing from 491 MMCFD to 2,054 MMCFD at year-end 2016. Download the Great Plains Energy Corridor Annual Report for a chart of all the natural gas processing plants in North Dakota. The state’s first liquefied natural gas plant is near Tioga. Liquefied natural gas is natural gas that has been converted to a liquid form for easier storage and transportation.